For years, claims that UN climate reports represent the consensus of the majority of international scientists have been mindlessly accepted and regurgitated by left-leaning policy makers and the media at large. But in the past week or so, it’s become more apparent than ever that those who’ve accused the international organization of politicizing science and manipulating data have been right all along. This latest disclosure again concerns what has become the favorite propaganda propagation tool of climate activists -- the infamous “Hockey Stick Graph.” The familiar reconstruction, which deceitfully depicts last millennium’s global temperatures as flat prior to a dramatic upturn last century, has been displayed and touted ad nauseum as irrefutable proof of unprecedented and, therefore, anthropogenic, global warming (AGW). Despite its previous debunking, the embattled AGW poster-child continues to languish in UN climate reports, which are unduly revered and quoted as gospel by all manner of proselytizers. In fact, just last week it had the bad timing to show up in a desperate UN compendium, released just days before Climate Audit published facts that promise to be the Hockey Stick’s (HS) long overdue epitaph. And those facts not only assuage any doubt of the chart’s fraudulence, but also of the deliberate and devious complicity of its creators, defenders and leading UN sponsors. But before delving into the sordid details, perhaps a little background is in order. And data derived from sources including tree-rings, lake sediments, ice cores and historic documents bear that position out. Indeed, it’s abundantly evident that since the last glacial period ended, over 14,000 years ago, the Earth’s climate has undergone multi-century swings from warming to cooling that occur often and with remarkable rapidity. And not one but three such radical shifts occurred within the past millennium. The years 900-1300 AD have been labeled the Medieval Warming Period (MWP), as global temperatures rose precipitously from the bitter cold of the previous epoch -- the Dark Ages -- to levels several degrees warmer than today. A sudden period of cooling then followed and lasted until the year 1850. 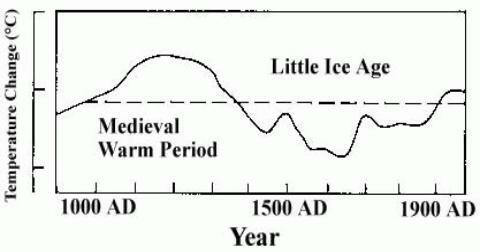 This Little Ice Age (LIA) brought on extremely cold temperatures, corresponding with three periods of protracted solar inactivity, the lowest temperatures coinciding with the quietest of the three (The Maunder Minimum 1645-1710). And then began the modern warming period, which, by the way, many scientists believe ended with the millennium itself. Given these natural shifts over the past 1000 years, it’s certainly not surprising that after a period of cooling, which followed a period of warming, we’d again enter a period of warming. During testimony before the Senate Committee on Environment & Public Works Hearing on Climate Change and the Media in 2006, University of Oklahoma geophysicist Dr. David Deming recalled “an astonishing email from a major researcher in the area of climate change” who told him that "we have to get rid of the Medieval Warm Period." In June of this year, Deming identified the year of that email as 1995 and the source only as a lead author of that month’s Global Climate Change Impacts in the United States report. Many believe that man to be Jonathan Overpeck – which Prof. Deming didn’t deny in an email response -- who would later also serve as an IPCC lead author. So it comes as no surprise that this reconstruction, which did indeed “get rid of the Medieval Warm Period,” was featured prominently in the subsequent 2001 TAR, particularly in the Summary for Policymakers (SPM), the highly-politicized synopsis which commands the bulk of media and political attention. This, the original and by far most ubiquitous version of the HS graph, was derived from a 1998 paper by Michael E. Mann, Raymond S. Bradley and Malcolm K. Hughes (MBH98). It was promptly met with challenges to both its proxy data and statistical analysis methodology. Of these, various papers by two Canadians -- statistician Stephen McIntyre and economist Ross McKitrick -- stood out in dispelling the AGW-supporting hockey-stick shape arrived at by MBH, claiming it the result of severe data defects and flawed calculations, particularly an invalid principal component analysis. In a coordinated effort to defend the refuted thesis, alarmed alarmists tendered a handful of supporting studies. Mann himself cheered those either attacking McIntyre and McKitrick or supporting his own reconstruction and dubbed them the “Hockey Team.” And the position of team forward and co-captain was bestowed upon Keith Briffa of Britain’s Climatic Research Unit (CRU), whose temperature graphs, derived from Yamal, Russia tree ring data were heavily cited by the IPCC as supporting evidence of MBH’s assertion of unprecedented 20th century warming. While studies reaffirming both the MWP and LIA continued to be published, congressional hearings and expert panels found MBH to be largely unsupported by studies relying on legitimate proxy data other than Briffa’s. Still, most alarmists continued (and continue) to defend the HS on principle. Which in no way dilutes this plain truth: By the time most Americans received their first lesson in climate hysteria in the Albert Gore lecture hall that was the 2006 film An Inconvenient Truth, the MBH chart the nutty professor stood before and offered as proof of impending doom was already held in disrepute by most serious persons of science. Lest there be any doubt, why else would the 2007 Fourth Assessment Report (AR4) -- notwithstanding the appointments of both Briffa and Overpeck as lead authors – give the graph short mention and exclude it entirely from the SPM? It appeared the Hockey Team was being sent back to the minors. That is -- for the moment. Given the current economic and political climate, it’s not surprising that the globe’s climate ranks dead last when Americans are asked to name the “most important issue facing the country right now.” Needless to say, that’s an uncomfortable position for the Greenhouse Gas Team, what with a Senate Climate Bill promising even more government control than its House counterpart at the plate and the December Copenhagen Climate Summit on deck. Amazing. But the frantic hype of this call-to-pointless-action quickly segues to blatant lies just three sentences later when Ban states “that climate change is accelerating at a much faster pace than was previously thought by scientists.” It would appear the Sec-Gen believes that the cooling temperatures the new millennium issued in have somehow escaped everyone’s notice. Imagine the uphill battle he’ll face should predictions of the U.S. Northeast suffering its coldest winter in a decade due to a weak El Nino come true. So it wasn’t all that shocking to spot this undeniably dramatic graph on only the fifth of this end-is-near report’s 75 pages. The striking chart is marked as Figure 1.3: Correlation between temperature and CO2. As its title suggests, it attempts to plot atmospheric CO2 concentrations and mean global temperature during the past millennium. Notice anything vaguely familiar about the temperature plot in red? Why, it’s our old friend, Mr. Hockey Stick – apparently having sat for a bit of a makeover. Interestingly enough, this reconstruction wasn’t lifted from prior IPCC assessments, or, for that matter, any UN entity at all. No, the source was actually a graphic posted to Wikimedia in 2005 by Hanno Sandvik, a Norwegian research biologist. Sandvik cited two data sources for his temperature plot – a 2004 paper by Jones and Mann (abracadabra – no more MWP) for 1000-1880, and, for the remainder, “instrumental records published on the web” by Jones, Parker, Osborn and – wait for it …… Briffa. So the chart the UN climate experts used to sell the CO2 -°C connection to an increasingly skeptical public was pulled from Wiki, crafted by an unknown biologist, conveniently ends about the same year warming ended, and is based on a debunked temperature reconstruction. It would therefore appear they consider Sanvik quite the unsung authority. Yet I wonder whether these geniuses are aware of this 2006 graphic, also from Sandvik, and plotting northern hemisphere temperatures over the past 2000 years. This one cites 2005 data published by Moberg, Sonechkin, Holmgren, Datsenko, Karlén, and Lauritzen as its source and paints a somewhat different picture. Hello MWP and LIA, where’ve you been? Any guesses whether or not UNEP would have used Sandvik’s chart had his temperature dataset been from Moberg et al. rather than Mann et al.? I contacted Hanno Sandvik a week ago last Saturday and asked him essentially that same question. He responded that he was unaware of the UNEP Compendium and therefore had “no idea which graphics they may have chosen.” He also pointed out that while Mann’s was global data, Mobergs was northern hemisphere only -- a point well taken, however MHB98 was also derived from NH data yet remarkably resembles the Mann “global” data Sandvik used. Also -- Take a look at the period between 1000 and 1800 in both reconstructions. Is it even the least bit feasible that averaging southern hemisphere data into the latter would produce the former? Or that UNEP strived to present the facts honestly? One of McIntyre's chief complaints when auditing MHB98 was Mann’s refusal to provide his data, methods and source code. The Hockey Team’s most dreaded opposing goaltender has been reporting the same deceptiveness from Briffa, who for years refused to release his Yamal measurement data. This, despite the fact that HS-defending papers relying solely on Yamal continued to be published in major science journals. But last year, Briffa used the data in a paper he published in the Philosophical Transactions of the Royal Society Journal. As the journal adheres to its strict data archiving rules, McIntyre convinced one of its editors to help get Briffa’s data released. And late last month, the data was indeed published at CRU. Last week, McIntyre analyzed the CRU archive Yamal data and proved that Briffa et al. had cherry-picked and manipulated data, intentionally omitting records not friendly to their position. In fact, when Briffa’s hand-selected figures were replaced by a broader dataset for the same Polar Ural region (much of which he had deliberately dropped), the Hockey-Stick suddenly disappeared, revealing no significant trend in the 20th century whatsoever! In Steve’s new graph, below, the Red represents the original 12 cherry picked Yamal trees, while the Black incorporates the broader Polar Ural dataset. Any questions whether or not global warming is Mann made? The public’s belief in manmade climate change doesn’t hang on its grasp of geophysics or thermodynamics. Technical explanations of positive feedbacks and radiative forcings, read by few and understand by fewer still, aren’t likely to foster acceptance of a new energy tax that will dramatically raise the price of literally every facet of human life. Let’s get real -- even experts on the subject can’t seem to agree on what caused modern warming. But alarmists know all too well that as long as citizens are convinced that warming is both enduring and unprecedented, such inconveniences as the missing hot spot, laughably mistaken climate models, 800 year CO2 /Temperature latency and perhaps even current cooling can be cleverly obfuscated with Goebbels-like double-talk and outright lies. And without the Hockey Stick’s counterfeit portrait of runaway 20th century warming, climate crisis peddlers’ credibility levels are reduced to those of used car salesmen. Not where you want to be when hoping to sell the instinctively absurd premise that the actions of mankind can influence temperatures in either direction. So they cheat. And they lie. And they have from the very beginning. Twelve years later, Schneider was a lead author of the IPCC’s TAR, the same UN report that formally introduced the delusory Hockey Stick Graph. Add lying perpetrators of fraud, and I'd say that about sums it up. Speaking on the Senate floor in July of 2003, Senator James Inhofe (R-Okla) rightly called the threat of catastrophic global warming the "greatest hoax ever perpetrated on the American people." Let’s make damned sure it doesn’t become the most expensive.